S T Y L I S H . M: Too hot for Saudi Arabia..? 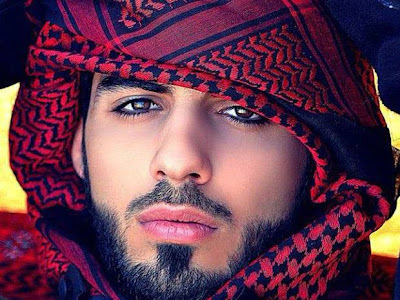 While 'doing coursework' I came across an article about this Emirati guy who was one of three men to be recently deported from Saudi Arabia for being so irresistibly good looking that there were fears of women being driven to distraction in their presence. I think that this country has finally reached a level of stupidity in a league of its very own. There are several things that sprung to mind when I read the article. - One, why and when did religious police get to decide upon who is ugly enough to stay in the country? Bit discriminatory if you ask me. Then again this is Saudi Arabia we're talking about, the land where quite literally nobody is equal. I mean, why stop at women and foreigners anyway..? - Two, I wonder what the Saudis would have done with Prophet Yusef [Joseph] (as) after he made all those women cut their hands. - Three, that is a very nice red shmagh. - Four, I wonder if any Saudi men that were present at the time of deportation were offended because they weren't being deported as well. - And finally, I should probably stop procrastinating and getting distracted by these articles. So what are your thoughts on Saudi Arabia's latest moronic move? I was also shocked after reading about it. But i think maybe it was such a commotion after the guy arrives because he is actually an actor/model. Maybe the people at the area were making some loud noises and fan-girling around him. In that case i guess it doesnt seem to bad. Just my opinion. Anonymous: That seems plausible actually! I think it's absolutely ridiculous. Are they going to screen everyone coming into the country and decide who is and isn't attractive and only let non-attractive people in? There's always another side to a story and we should try and listen the "stupid" policemen too. What if those people were dressed and behaved inappropriately? And yes, there is such a thing- even for men. Try googling "biscolata" It's a series of ongoing chocolate ads we see everyday on TV here in Turkey and it's hard to look away! I think you are being offensive in the way you react. I'm not from Saudi Arabia but making this argument about their IQ levels is shallow. Guess who creates people with the IQ levels He pleases? How can you be "illegally handsome"? This is just beyond ridiculous. He's always in the Instagram popular pages, it's not his fault for looking like that. Sena: WA. Did you read the article? It had nothing to do with behaviour, it was his looks. I can understand why you think the IQ thing is offensive, but why shallow just out of interest? Masruba: I know right. He's pretty average anyway, what's the deal..?! cucubi: Thanks :) I like your blog by the way! AAHAHAHHAHAHHAHAH omg when u said..
"Four, I wonder if any Saudi men that were present at the time of deportation were offended because they weren't being deported as well."" This is so true..i think women would be offended also if only one lady was singled out for her beauty and not others...anyway all in all i think its best to laugh at this nonsense and not take it to seriously or interpret what saudis are like because of it. Remember when there was the whole breastfeeding outrage? grown women breastfeeding drivers or male helpers in order to make them mahrams..loooooool it never ceases to amaze me what storys come from saudi. Oh that is hilarious! Yeah I would have been offended at not being deported! How mean calling me ugly by not deporting me. I was bothered by the same news sis! Anon: I agree, it's best to laugh it off but sometimes the stupidity just overwhelms me haha! Ahh the breast feeding thing was hilareously disgusting! Shereena: Glad I'm not alone! Gosh this made me laugh! Ahhhh what can I say, douche bags are rampant..
actually though people just spreaded this around, its not knowing if is him or not. That's true actually, there isn't knowing for sure it is him but it did happen. And yes I have seen better looking Saudis! I don't think it was a moronic move at all. According to the Arabic versions of the incident - the man & his friends (as well as female singers) were causing too much commotion so they broke it up and later sent them away. Newspapers just want to twist it and say that saudi's got rid of him because he's too handsome... a pretty low move if you ask me... what so there are no handsome men in saudi arabia? They just want to make saudi's look like insecure, simple minded and sexually depraved people. Huda: Hm that's interesting. I think you're probably right you know! This is a completely mislead article, these men were deported because they were singing LIVE on stage which is against the KSA law. (for the record i was present there at that time when religious police escorted them off). it was in janadriyah festival when they were singing and dancing infront of womens then ofcourse you will not just be deported maybe jailed i hope they dont bring such people again creating fitnah in society. I agree with point number 5 ... distractions. What do I think? I think he looks too trimmed up and pretty. He needs a bigger beard. Joanna your comment really cracked me up haha! :D I have to say though, I like his beard lol! I think one should be very careful about generalising about the 'stupidity' of a whole country and its people. I would worry if I would do this that Allah might consider it as me slandering my brothers and sisters and thus eating their flesh. I also highly doubt the reliability of the source of the IQ statement, although the source was not even mentioned. I am blessed with a lot of wonderful Saudis in my life and it saddens me to constantly encounter other Muslims making negative generalisations about the entire country and its people when most of the time they have not even ever spent any significant (or any at all) time there. There are without a doubt problems in that country, but there are in other countries, too. I don't understand why we have adopted such double standards when it comes to Saudi Arabia. Other countries do not seem to be under the same scrutiny. I imagine that we somehow expect it to be perfect as it holds Mekkah and Medinah, yet perfection is reserved for Jennah not for Saudi Arabia. I don't intend to open a debate or discussion, but I would like my sisters to understand that these articles/comments/etc. can be very offensive and hurtful and mostly there is not much truth or sound research to them. Well, if any guy is getting deported (I don't know if he's Saudi, or even in the Middle East), it has to be Ahmed Angel. It's delightful, but his narcissism is just something out of this world!! It's so over the top it almost loops around and becomes self-mocking modesty! It is insane bc Saudis and Emirates look the same. @Yukirat...looool omg that was hillarious ...the leprechaun styled first photo is to die for...no offence but i can spot a gay from a mile away and there is def some some high readings on the gaydometer.